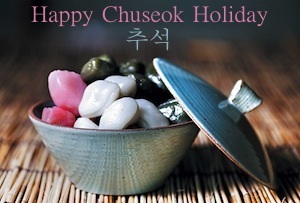 Chuseok is Korea’s thanksgiving and harvest festival and it’s the second biggest single holiday of each year, similar to Christmas in the UK. At this time families get three days to eat together, play games, watch movies and then eat even more. This year Susie was planning on going to her grandmother’s house in the county to see her family. She suggested Josh and I join her and meet the family, we agreed. It was only as the holiday got close that nerves began to kick in. Susie had told us that none of her family speak very good English, so there wouldn’t be much conversation without Susie’s help and everyone we spoke to before said it was quite a big deal that we were going to meet her family. Also, we’d be spending the night there. When the week arrived we had to work on Monday and Tuesday but Wednesday we were free. 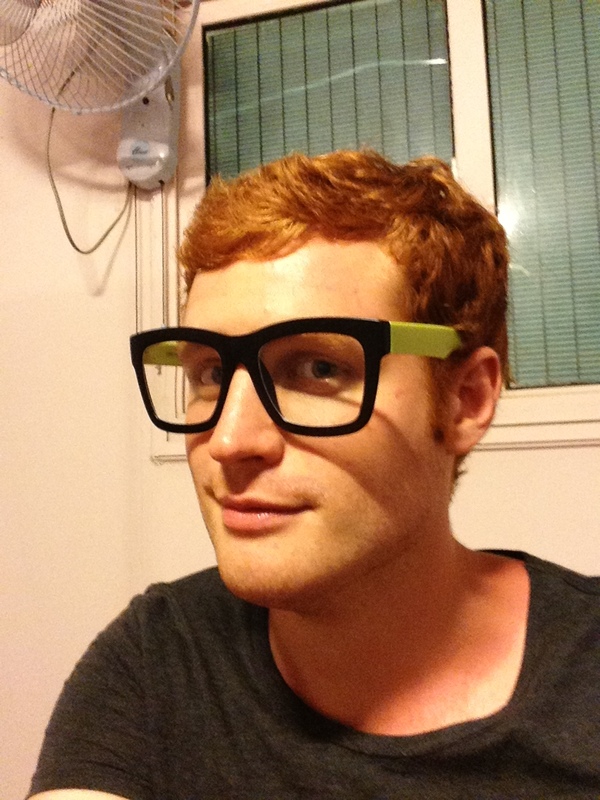 Josh and I decided to have a few drinks in Bupyeong to celebrate. A few turned into a few more, which turned into many and we ended up getting home at 7am with a few friends and drinking some more. Bad idea, very bad idea. I got a call from Susie the next day, she wasn’t happy, in fact she was fuming. 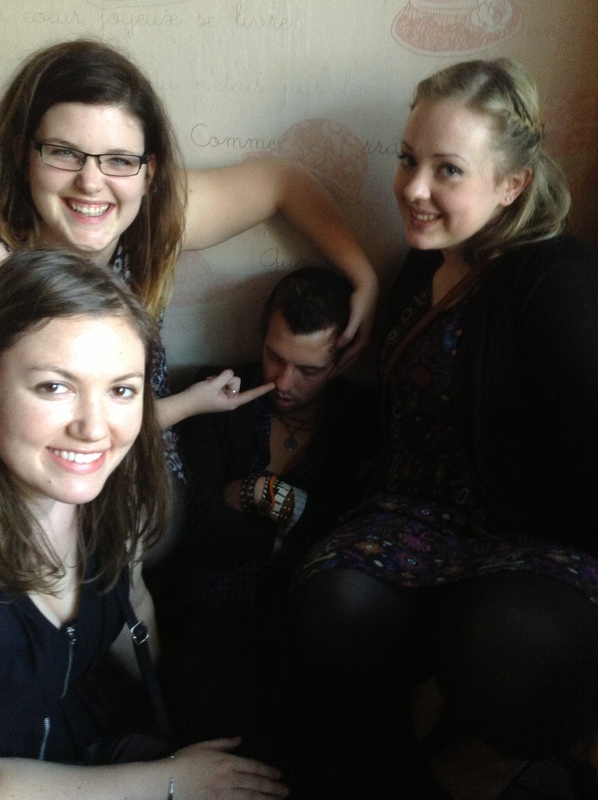 The bus was leaving in less than an hour and a half and I was in bed with a horrendous hangover. I jumped up and got ready in record time. As I left I checked my watch for the hundredth time that minute. 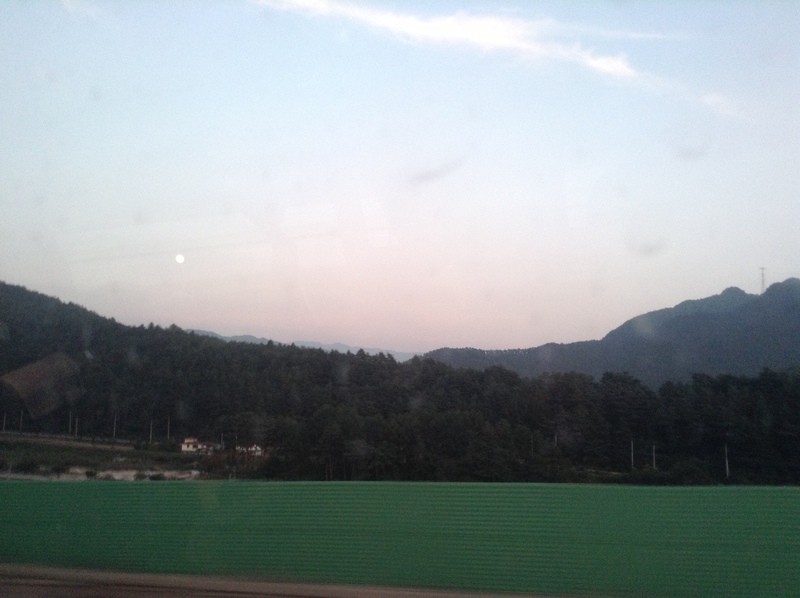 I had an hour and ten minutes to make an hour and twenty minute journey to the other side of Seoul. I decided I’d worry about that later and ran off down he road. With Josh I’m afraid I had to go by the old pirates code, whoever falls behind gets left behind. As I ran I felt a) pretty hungover b) very thirsty and c) insanely guilty for what I was sure would be the second missed deadline with Susie. I got on the train and checked the journey time. I would arrive at the station at 4.30, ten minutes after the bus was supposed to leave, and the train station and bus station were on opposite sides of the road. S**t. I decided to get off he train at Sindorim, just outside Seoul, and get a taxi to the bus terminal. I wasn’t sure it would be faster but the taxi could take the highway and I might just make it. I’d worry about how much it would cost later. I jumped into the taxi panting and hoped the driver would sense my urgency. We got going and the satnav said we’d get there at 4:21. The bus was departing at 4.20. Close, too close. I arrived at 4:19 after an agonising minute of driving in circles to find the right place. I found wifi and got a message from Susie that just said ‘RUN!’. I ran and saw Susie, without a word she spun around and tore off towards the bus, shouting and pushing to get through the busy crowd. The bus hadn’t left but there was a problem. All the passengers with tickets were on board and the driver didn’t want to let us on, even with tickets, because we were late. All looked lost but after tense few minutes we were let on and got the last two seats. I grovelled and begged for Susie’s forgiveness until she told me to shut up and we both slept for most of the two and a half journey into the countryside and to Susie’s grandmothers house. Her uncle met us at the bus station and we drove to a supermarket to buy a gift for the family. It’s normal to give a special box of fruit but her uncle told us there was already a mountain of fruit at the house so we went for honey instead. Then we headed to the house. I was more than a little nervous. We got to the house. Susie’s family greeted us, her grandmother seemed particularly happy to see me and I said a slightly awkward hello to aunts, uncles and cousins, some of which I already knew. Susie’s brother was there too. Everyone was friendly if a little unsure of what to say. I sat down and tried to look like the sofa as Susie caught up with her relatives. Soon it was time for food and one of Susie’s aunts had made a feast of delicious spicy ribs along with about fifty sides. Everyone was sitting on the floor at low tables that had been brought out especially, something my legs and backside still haven’t quite adapted to. All discussion was of course in Korean, but Susie translated anything I needed to know and dinner seems to go quite well. After dinner Susie and I went for a walk and met the (adorable) dogs. She told me that the family wasn’t usually his quiet, which made me feel a little bad, but that they were adjusting, which made me feel a tiny bit better. 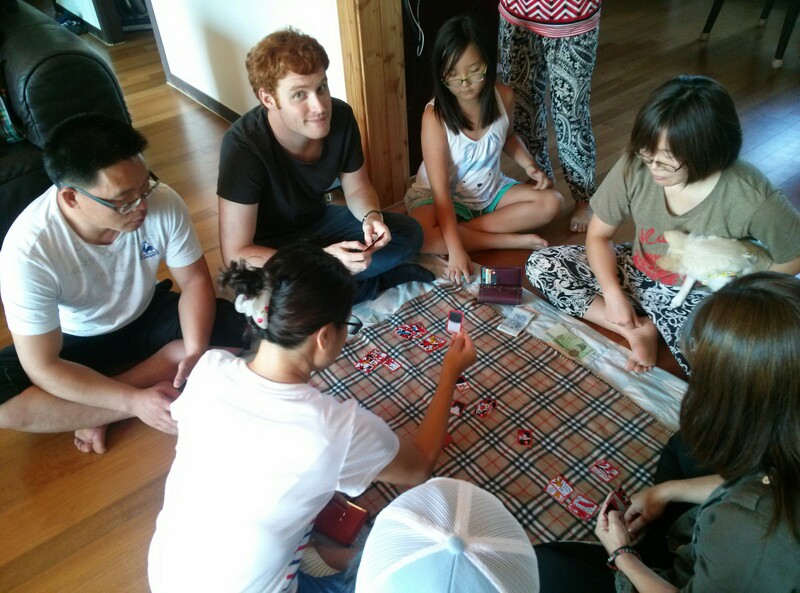 After our walk Susie’s aunt taught us a Korean card game, Go/Stop, which is played with small, tile-like cards. The game itself seems simple but the scoring system seemed to be completely random and I occasionally went from losing to winning without actually doing anything. Somehow I managed to get the hang of it, but Susie, who was translating the rules for me, was having a little more trouble. Later, we joined her cousins on a trip to a Hof, popular places which serve fried chicken and beer. It was nice to be able to relax a little more with younger people, unfortunately I couldn’t pull of her cousins hyper-fashionable glasses. After the beers we headed to a play park together, along with the youngest of Susie’s aunts, and around 1am we went to my first ‘rock park’. It was pretty much what you expect a rock park to be, huge stones were dotted around, naturally shaped like different things, such as turtles or broken eggs. We got home soon after, got some blankets and found ourselves a space on the floor to sleep alongside her cousins. The next day we were woken by the sounds of people and cooking. As the older members of the family got up, the younger ones moved to their beds to sleep a little more. Breakfast was another feast and once it was over everyone got ready to go and visit the burial site of Susie’s grandfather. We drove further into the country and to the base of some mountains. 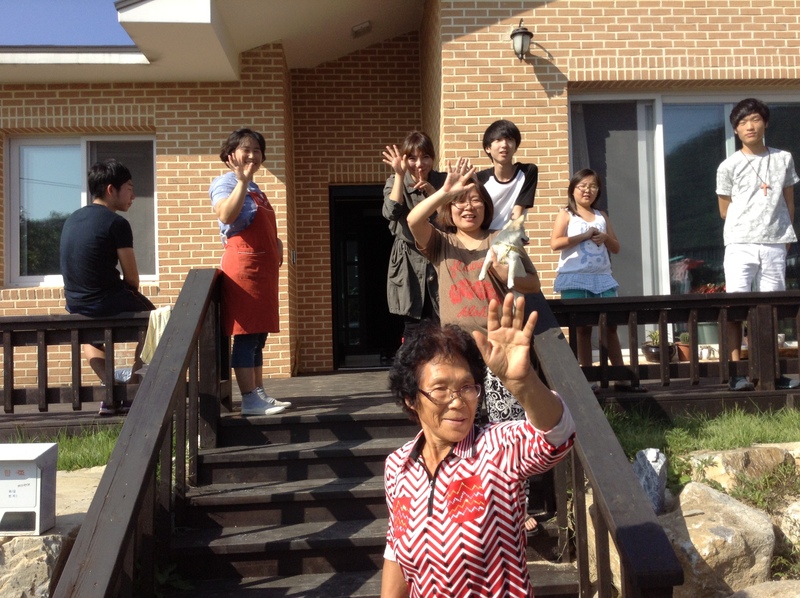 It is traditional to visit the graves of ancestors on chuseok. A food offering is given, and maybe some soju too, and the family all clean the area and the burial mound together and say a prayer. 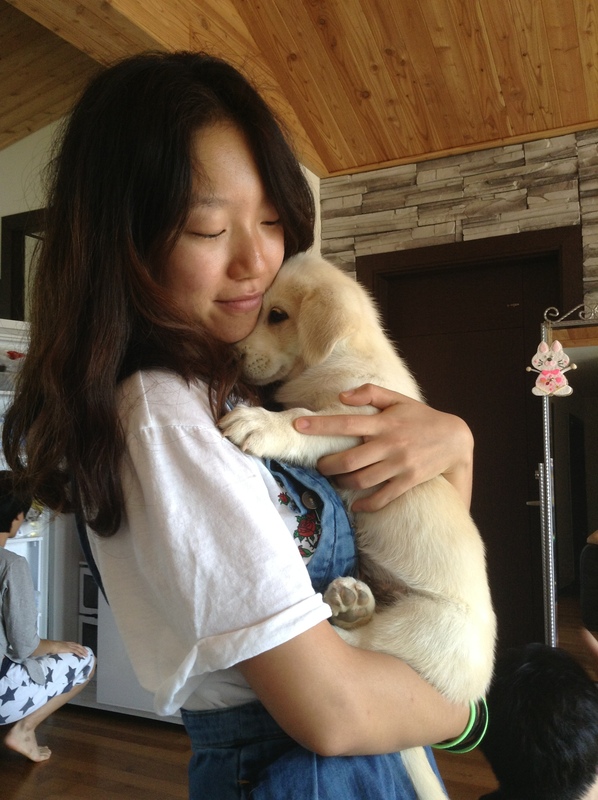 The atmosphere was light and a puppy that had come along was making mischief, running up the mound, which came to my neck, and jumping into the pile of moss that had been cleaned off it. Once the prayer and offering were done we headed back to the house for even more food and a few games of Go/Stop, and this time the stakes were a little higher. The wallets and purses were brought out and here was money to be won, or in my case, lost. Susie’s uncle was helping me play against her aunts. He was even peeking at other players cards to try to give me the upper hand. Despite this I was losing badly and soon I was out of money. Susie’s grandma handed me some more money so I could stay in the game and before too long I had won most of the money I’d lost back. But the last round was my worst and at the end I had I hand over 10000₩, about £6. It was a bad loss but once it was over one of the aunts gave me back more money than I’d lost, despite my protests. It was a nice way to end the visit. A little later we were heading back to Seoul on the bus and it was all over. The rest of the holiday was spent being lazy and thoroughly enjoying it. 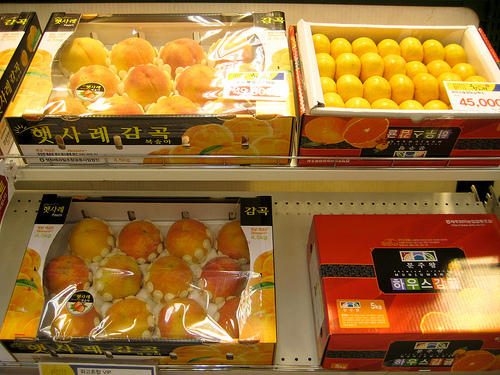 This entry was tagged Chuseok, Go/Stop, Korea, Korean food, South Korea, travel. Bookmark the permalink. Thanks FfS, it was definitely an interesting way to spend the vacation. Other traditional activities include making moon-shaped rice cakes and Ssireum, Korean wrestling, but I didn’t try either if those.